There is still significant stigma around eating disorders; they are framed as disorders of the young, white, vain, rich, and thin. But you have heard about that stereotype before. We repeat it time and again, and yet… very little is changing. We cry from the rooftops: “eating disorders can happen to anyone!” But, we are met with tenacious representations of eating disorders as being a privileged diagnosis. Surely by now we might have made some headway in smashing stigma. Unfortunately, despite the labour of countless activists, researchers, and treatment professionals over the years, we still face an environment in which: a) Only some people are “read” as “legitimately” suffering from eating disorders; and, b) Those who are recognized are assumed to be untrustworthy, vain, and often, beyond hope. These falsehoods persist in the face of our valiant cries and rallying calls, and the stigma is literally killing people. In my opinion, until we start truly listening to and uplifting the voices of those who have experienced eating disorders, we will not break down this stereotypical representation. To do this is a multi-layered process, however, and it involves a fundamental shift in the way that eating disorders are prevented, researched, and treated. When we restrict research studies to only those who have received diagnoses, we capture only those whose disorders were understood as legitimate by doctors, whose training in eating disorders is extremely limited (to less than 3 hours throughout their education, in many cases). When we respond to “non-compliance” to treatment with removing all support, we lose the trust and the buy-in from those for whom treatment-as-normally-delivered doesn’t fit: people who live far from treatment centres, those who are unable to afford to take time off work and life to attend treatment, those who cannot afford to incorporate meal-plan prescribed variety into their diets, those for whom current treatment modalities are culturally inappropriate. When we try to prevent eating disorders and “obesity” (a body size, not a disorder) at the same time, we send extremely mixed messages about how we are supposed to live in our bodies. When we continue to try the same strategies, year after year, despite knowing that they do not work for all people, we are allowing stereotypes and stigmas to persist. Breaking down stigma is a systemic task, but it starts from within. It starts by thinking deeply about the reactions we each have when we see differently sized bodies. It starts by recognizing the way societal prejudices and assumptions and messages seep in to our own frames of thinking. When we can acknowledge that we all carry biases, we can start to challenge them. When we are open—truly open—to hearing stories that do not fit with our pre-imagined narratives of what eating disorders and recovery look like, we can start to move, ever-so-slowly, to a place of more openness and support. Andrea LaMarre is a PhD candidate in the Department of Family Relations and Applied Nutrition at the University of Guelph. Her research focuses on eating disorder recovery from the perspective of people in recovery from eating disorders. Andrea is involved in the eating disorder awareness community as co-chair of the Academy for Eating Disorders (AED) Recovery Special Interest Group and a member of the AED advocacy and communications committee, a member of the Eating Disorders Association of Canada, as a volunteer for the National Initiative for Eating Disorders, and chair of the Association for Size Diversity and Health’s social media committee. While this response was infuriating and wildly inaccurate, it wasn’t surprising. To the outside world, eating disorders are a choice made by vain teenaged girls who just want to be thinner. In reality, nothing could be further from the truth. The people I see in my practice are all ages, all genders, all races, all sizes, with one thing in common: they’re in a lot of pain. Some of the pain is caused by the eating disorder. Some of the pain predates the eating disorder, and relies on the eating disorder to lessen its sting. Either way, the pain is not a choice. And it isn’t exclusive to one population. The stigma about who gets eating disorders keeps people from seeking help. It creates shame in those affected, and only makes the problem worse. And, because the stereotype says that only teenage girls get EDs, they make up the majority of people showing up in treatment. As a result, treatment and research is primarily geared towards this group. One of the great things to come out of that research is Family Based Therapy. It has shown great promise for the treatment of eating disorders. Unfortunately, this model, currently presented as the way to treat eating disorders, isn’t a possibility for most of the clients I see. FBT relies on family involvement, and often requires one parent to stay home with the child full time. Unfortunately, that isn’t accessible to most people who aren’t wealthy, or to those who don’t have an involved family. And, it just isn’t a possibility for most adults, regardless of demographic or family situation. As long as we’re only looking at eating disorders through the very stereotypes we’re trying to fight, a lot of people will be left out of the conversation. Treatment will continue to be exclusionary, and the research will still focus on those same groups. No two clients that I see are alike. Their eating disorders seldom respond to the same methods. If we want the public to see eating disorders as more than a wealthy white teenager’s disease, we have to start creating treatment options for more than that demographic. Breaking stigma starts at home. Let’s work together to be the change we want to see in the world. It’s a beautiful, diverse world. We need to do better at reflecting that. Hi. (Waves.) My name is Sally. I am older and struggle with an ED. We come in all body shapes and sizes and you wouldn’t notice us unless we are very fat or very thin. Those of us with thin bodies are often seen as success stories; strangers sometimes compliment us and ask how we did it. On the flip side some are treated with disbelief, disgust and fat stigma, and sometimes disdain for not participating in “Culture of Thin”. Y’all know how triggering it is for our weight to be called out in any way. We are women who have badly relapsed from ED remission in later life, women falling into our first ED due to midlife stresses, or women who have struggled for decades. We suffer the highest mortality rates after we are 35 years, and are the fastest growing cohort of newly diagnosed EDs since the recognition of Binge Eating Disorder. Our bodies are becoming less resilient and susceptible to major system failure and major bodily damages, such as irreversible osteoporosis. We may be labelled as chronic or treatment resistant in traditional settings, but actually, we believe we are unable to access age-appropriate treatment. Many traditional treatment settings are designed and delivered around the needs of young people, who may have struggled for years, while many of us have struggled for decades: similar to treating people with stage 4 cancer with stage 1 treatments. Older adults experience the plethora of rules in traditional treatment, which may make sense to us in treating youth, but for us they feel bewildering. We can also feel “othered” when we are surrounded by youth with few things in common. Younger people can look forward to decades of future opportunities; older adults are often looking backwards at lost opportunities: education, jobs or careers, a multitude of missed social events (like office parties, potlucks, for example), or giving birth. EDs can wreak havoc on relationships, and lead to divorce or separation. Single custodial parents with EDs struggle to find care for their children if they need to work, much less be away for weeks in treatment programs. Often, public providers only offer time-limited treatment or certain treatment opportunities, and advise us to find private therapists, which is both expensive and overwhelming due to the number of professionals listing EDs as their specialties. This is especially difficult if we need therapy for both EDs and other comorbidities. No one asks us why we often fail at recovery in traditional settings. They should. We are survivors, not success stories. They should be curious. Otherwise, there will be no treatment opportunities solely aimed at older adults, no groups, no new treatment paradigms, no best practices, and the result is that we end up in traditional settings eating at all our meals and snacks facing youth, youth, who may have struggled for years, but not decades. The experienced listed have been experienced by members of a private Facebook page for older adults. Admin of the first online forum designed for people in ED recovery, admin for an almost 800 member private Facebook group designed for adults nearing or over 40 years old, real time facilitator of a support group for adults. “She’s such a beautiful girl”, “Why is she doing this to herself”, “Just tell her she has to eat”, “Maybe if she had some friends for dinner she would eat”, “Maybe if she got a job she wouldn’t be so bored and would feel better”, “Get her out of the house doing things”. On and on and on. For 17 years now, slowly getting worse, and these comments come from family and friends that I have spent years educating about our loved one’s illness. Unless you live with this illness, understanding it seems impossible, and this MUST change. Many people continue to believe that eating disorders are a choice, are a desire to look a certain way, are not wanting to grow up, are a result of over controlling parents (especially mothers). Many health professionals are not up to date in their understanding and education of eating disorder research and treatments, which allows the disease to perpetuate, and yes, this is a disease. Eating disorders are a brain-based, mental health disorder, with a genetic basis, and often times in anorexia, activated by a period of low caloric intake/negative energy balance. Why is this so hard to understand? If you look at documented mental health symptoms of starvation you would see signs of a restrictive eating disorder. An eating disorder is a severe mental health disorder encompassing every aspect of our loved one’s life and that of our family. Do you think anyone would, by choice, live like this? As an adult, be unable to work or socialize, get married, have children? Do you think a person with an eating disorder enjoys watching their life slip away as their friends and siblings grow and prosper? Canadian treatment for eating disorders is haphazard. Lack of trained professionals, lack of treatment facilities, long waiting lists; all this and more contribute to promoting readmission due to early discharges and ineffective outdated treatment. I truly believe that if the stigma around eating disorders was eradicated, people with eating disorders would be looked upon with respect and compassion, and receive treatment for their serious disorder and, as a result, there would be more education, funding and timely treatment available. 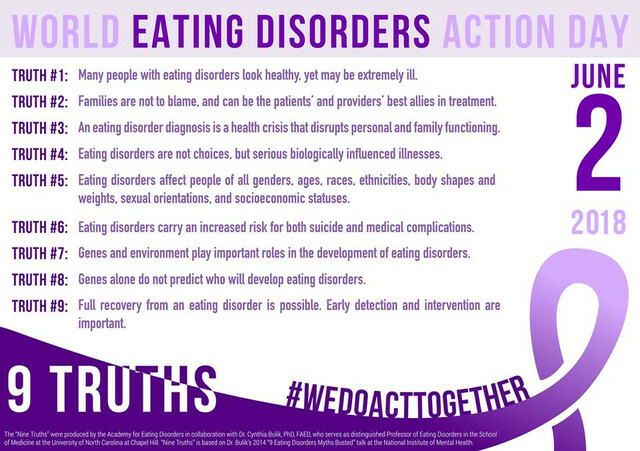 Let’s work together to elevate and promote evidence based knowledge about this terrible disease and get rid of the social stigma around eating disorders. Karen McBoyle is the mother of a wonderful 34 year old daughter who has been suffering with an eating disorder for 17 years. She is actively assisting her daughter in trying to get well. She is an advocate for increased education, funding and timely treatment for this life threatening condition. In addition she is a devoted wife, mom to another daughter and is happiest when holding her young grandsons of three years and two months. Last year I was invited to attend the annual garden party hosted by the Waterstone Foundation focusing on helping people with eating disorders. This fundraising event brought a lot of people together whose lives have been affected because of eating disorders. In attendance were affected people, caregivers and professionals who want to help people with eating disorders. For myself it gave me an opportunity to talk about making the invisible, visible! Incredibly empowering. I have spent a good chunk of my life battling with mental health issues, eating disorders, PTSD, diabetes, all invisible challenges that have affected my life. Given an opportunity to make these challenges visible is all that I could ask for. Today going forward. I want to really encourage people who battle with these invisible challenges to understand that there’s no problem, no shame, no stigma at all, my making it, visible. Some days I wish amazing opportunities like this were accessible 20 or 30 years ago to make these challenges visible. My eating disorders and other mental health challenges have not gone away. I believe these challenges are going to be with me for the rest of my life. With organizations like the Waterstone Foundation, there is hope for people who battle with this challenge. I really want to encourage people to support this amazing organization. If you would have told me a number years ago, that I was going to stand up in front of this group of people and disclose that I have the eating disorder, I would’ve laughed, “saying not a chance”. Today, because I did speak up there is a lot more support out there to help people who battle with eating disorders. I especially want to give this message to other males who have eating disorders. There is no shame in disclosing and getting help. Eating is an essential part of life. Please don’t ever hesitate to speak up. The life you could be saving is your own and so many others who are battling this. We have an election coming up here in the province of Ontario in September. Let’s make sure that this mental health issue is visible to these people who are going into the legislature so they can talk about some of the challenges for people in Ontario, and find ways to provide help with mental health challenges. We MUST be seen and heard. I will continue to do anything that I can do, to help with making these challenges visible. I created a T-shirt design to make my challenges visible and I’ve been amazed at the feedback I’ve received from different people when they read the shirt and thanked me for making it visible. Let’s continue to do what we can to make this challenge visible.